What would you get if you tripled every ingredient in a lager beer except the water? Zeigensauger Doppelmaibock: a recipe that has evolved from the German bock lager tradition, but inspired also by ‘t Ij Columbus beer, brewed in Amsterdam. Ziegensauger, like Columbus, comes in at 9% ABV, making it considerably stronger than Maibock-style beer, which traditionally maxes out at around 7.5%. That makes this a Doppel Maibock! 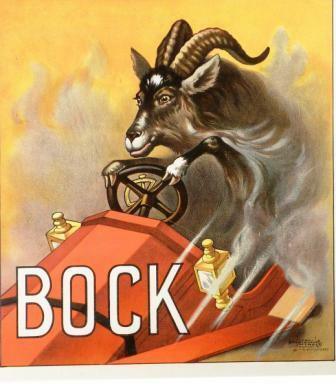 The traditional symbol of bock beer, the goat, has been consumed in this case by the German version of the Chupacabra. Zeigenrsauger is a goat hell-bent on destruction. Zeigensauger gets its fullness of flavor from a micro-mash of pale, pale crystal, Munich, CaraPils, and even black malt. The backbone is provided by 3.4 kilos of Cooper Pilsner extract, and 1.5 kilos of Breiss extra light DME. The beer is hopped with German Hallertau, Crystal, Pearle and Saaz varieties for the main additions, and dry-hopped with more Hallertau, which lays down a spicy aroma beside the rich maltiness. 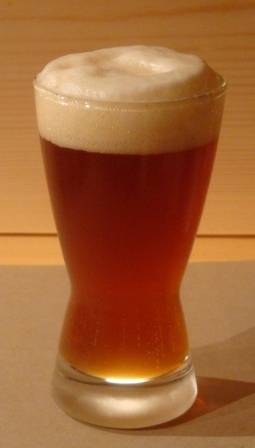 Wyeast 2112 California Lager yeast, with its high alcohol tolerance, ferments the brew for four months at a temperature below 16 C (61 F.) It is bottled using corn sugar syrup made with a Saaz hop tea. Held another two to six months, this is a monumental beer that crashes around like a goat, sucker! This entry was posted in Uncategorized and tagged barley malt, beer, bock recipe, doppel bock, fermentation, homebrewing.